I see Genesis Gold® has green tea and royal jelly, are they stimulants? I explained that there’s not enough amount of green tea and Royal Jelly in Genesis Gold® to create a stimulant effect. The amounts of all the herbs are sub therapeutic. Together they create a symbiotic healing within your biochemistry. 1) Genesis Gold® enhances mitochondrial energy output through nutritional support of your cells. 2) Genesis Gold® enhances cellular uptake of thyroid hormone optimizing energy production. 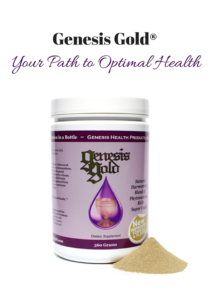 3) Genesis Gold® optimizes cellular detoxification pathways which enhances clean energy production.